Price Chopper Weekly Coupon Matchups 8/10-8/16! Current store ecoupons HERE - last week! Whole Center Cut Boneless Pork Loin - $1.99 lb. 16-20 ct. Raw Shrimp - $13.99 lb., use $2 in ad bonus coupon = $11.99 lb. 70-90 ct. Cooked Shrimp - $9.99 lb., use $2 in ad bonus coupon = $7.99 lb. 31-40 ct. Jumbo Cooked Cocktail Shrimp - $13.99 lb., use $2 in ad bonus coupon = $11.99 lb. Red, Black or Green Seedless Grapes - $2.99 lb. Eastern Peaches - $1.49 lb. Green or Yellow Squash - $1.98 lb. PC Apple wood Smoked Turkey Breast - $5.99 lb. D&W Oven Classic Turkey Breast or Baby Swiss Cheese - $7.99 lb. $0.75/1 Pouch from 7/27 SS = FREE! 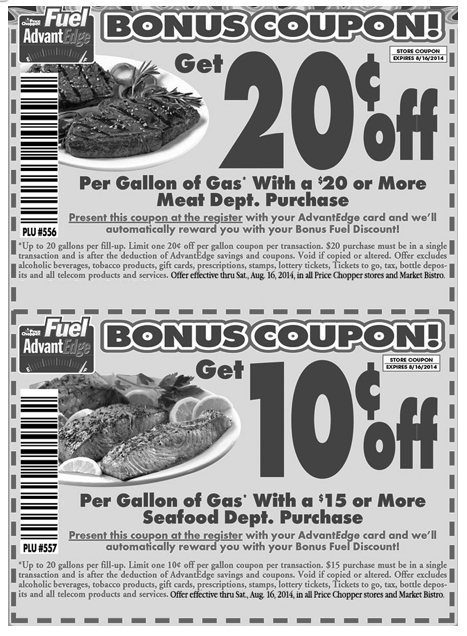 = $0.36 each + earn $0.20 off per gallon, plus use additional $0.15/$20 fuel coupon (if you received it!) = $0.35 off per gallon!